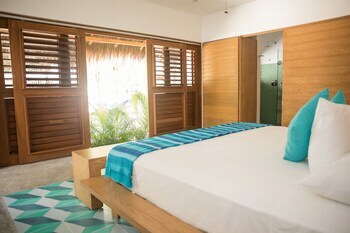 With a stay at Prana Boutique Hotel in Tulum (Tulum City-Centre), you'll be within a 15-minute drive of Tulum Mayan Ruins and Tulum National Park. Featured amenities include luggage storage and a safe deposit box at the front desk. Free self parking is available onsite. With a stay at Casa Rosa Catemaco in Catemaco, you'll be a 4-minute walk from Carmen Basilica and 6 minutes by foot from Lake Catemaco. The front desk is staffed during limited hours. With a stay at Hotel Quinta Chiapas in Tuxtla Gutierrez, you'll be within a 5-minute drive of Cana Hueca Park and Plaza Crystal Shopping Mall. Free self parking is available onsite.